What can I send to Germany? What items are restricted? Germany is an exciting place to visit, with so much to see or do. You may find you need to take excess luggage if you want to enjoy some of the many outdoor activities, or if you’re looking to pick up some great souvenirs or just enjoy some shopping. This is where Send My Bag can step in and help you out. We can pick up and drop off your excess luggage, from your home to your hotel, so you don’t have to deal with all the stress of dragging several bags behind you. With many budget airlines you find that baggage allowances are severely restricted or that they charge high fees for extra luggage. Send My Bag is a great affordable option that will allow you to take your extra items. You simply pack your heavy extras, for your holiday, business trip or relocation and we will deliver them to your hotel, new home or office for you. If you have larger oversized items, such as skis or golfing gear, we can also take care of these items safely and securely for you. Germany is a popular destination for international students deciding to study abroad, or for those completing a term of study under the Erasmus scheme. Students can use Send My Bag to ship their possessions to Germany, thus allowing them to quickly set up home abroad. It also means they can bring with them many more items than they could take on a plane, and they can ship it all back home again when term ends. You can use the services of Send My Bag to send your luggage and boxes to Germany. If you are taking a short break in Germany or if you are working there for a year, or longer, you can save yourself a lot of upheaval by sending your possessions with Send My Bag. This way, you can bring with you many more of your home comforts and keepsakes than you could if you brought them with you on a flight. You can also rest assured in the knowledge that your possessions are being looked after for you, allowing you to get on with exploring your new surroundings. To learn more about sending luggage to Germany, visit our ‘How it works’ page, or our ‘FAQs’. Golf is becoming more and more popular in Germany. The country has over 700 golf courses, of which Hamburger Falkenstein, Bundersand Sylt and Winston are among the best. It is easy to send golf clubs to Germany with Send My Bag. Without dragging large golf bags behind you, you will find it much easier to travel to your final destination in Germany. You will also avoid fees for oversized baggage from your airline. So why not consider sending your golf clubs to Germany with Send My Bag. Make sure you find out how best to parcel up your golf clubs by reading Send My Bag's information on how to send golf clubs. You can send your bicycle to Germany and enjoy cycling through Germany's countryside or in one of its fascinating cities. Sending your bike to Germany is much easier than checking it into the hold of your plane. You will avoid oversized baggage fees and won't have to transport the bike to and from the airport. Your bike will need to be taken apart and properly packaged before being sent to Germany. To learn more about packaging your bike, see our information page on bike shipping. You can go skiing in Germany in a number of regions, including Upper Bavaria and the Zugspitz Region. You can avoid oversized baggage fees and the hassle of dragging your skis on public transport by shipping yours skis with Send My Bag. Find out more about ski shipping on our information page and learn about how to safely package your skis. If you are attracted by Germany’s job opportunities and are moving there permanently, you will have to consider international removals to Germany in order to transport all of your possessions. Before you give anything to the movers, however, make sure that all your items are carefully packaged so that they won’t get damaged in transit. Use suitable packaging for your possessions and seal everything up well. If moving to Germany to study, or for a third year abroad, you will need to bring lots of your possessions with you to help set up home in your student accommodation. You will need books for your course, or teaching materials if you are spending the year as a language assistant. And, you will need all the other everyday essentials, like DVDs and clothes. Top German universities you might decide to study at include the Technische Universität München, Ruprecht-Karls-Universität Heidelberg and Ludwig-Maximilians-Universität München. To find out more about student shipping to Germany visit our student shipping page and get your 10% student discount. Sending a parcel to Germany is a great option if you have left something behind at home. You can just ask a friend to pop it in a box and send it on to you. Or your friends and family might want to send you a care package to Germany to help remind you of home, or even Christmas and birthday presents. This is a great idea for expats who have gone to settle in Germany or for students who are feeling a bit homesick. Send My Bag can send parcels internationally to Germany for you. Make sure you choose a sturdy box when sending a parcel to Germany and tape it up well so nothing gets damaged in transit. Take a look at our information on how to send a parcel to find out what you can send with Send My Bag and how to package your items. And don’t forget to research Germany’s rules on shipping brand new items. You could send big bulky items, such as a sofa or armchair, to Germany using air freight. Sending items by air freight usually takes one to two days, but can be quite expensive. How much you pay depends on the weight and size of your shipment. You will probably also have to use the services of a customs agent to handle customs clearance for you. And, you need to get your items to and from the airport. Costs could, therefore, quickly mount up. If you send internationally by air freight to Germany your items will likely arrive at one of the major airports, such as Berlin Airport, Hamburg Airport or Munich Airport. Instead of air freight, you could choose sea freight or container shipping to transport your possessions to Germany. This is a good option if you don’t need your items immediately. Again, this option is usually used when shipping large bulky items, such as a snooker table or a car. Sea freight usually means shipping items in large containers loaded onto cargo ships. It can be less expensive than air freight, but you will still need to use the services of a customs agent and will need to sort out how to get your items to and from the ports. So, the cost could be more than expected. When using container shipping to Germany your items will most likely arrive by ship at one of the major sea ports in the north, such as Hamburg, Bremen or Bremerhaven. The consignee will need to provide a copy of their passport and their flight ticket/boarding pass to assist with clearance. Goods for returning German Residents that are declared as originating outside of Germany may be treated as new items by customs, resulting in delays for inspection and further information being required, as well as possible duty and taxes. If any goods of non-German origin have been owned for more than 6 months and the owner is returning to Germany having relocated back from living for 12 months or longer in the country they are shipping from, then duty relief should still be applicable, providing the consignee provides evidence of their Registration back in Germany, and evidence of living abroad such as proof of employment or study. Personal effects are usually assessed as used items which have been in the sender's possession for 6 months or more. If your bag is checked by German customs and is found to contain brand new or commercial items your shipment may be assessed for customs duties and taxes. If you are sending Christmas gifts to Germany please make yourself aware of potential customs duties, follow any advice given and attach all necessary documentation. Most countries offer a generous duty free allowance for personal effects and the majority of Send My Bag shipments worldwide will not be stopped by customs. In Germany this allowance is not automatic; you will need to provide a copy of your passport and flight ticket or boarding pass. In order to show that your shipment consists of personal effects, you will be required to complete a brief non generic packing list online, entries to be made in the format: "5 x Pairs of Socks, 2 x Denim Skirt, 3 x Cotton Shirt", and so on, rather than as "10 x Used Clothing". We advise all travellers take 5 minutes to check how their personal circumstances and what they are sending will be assessed under the prevailing customs regulations in Germany. You can find out more about customs by visiting our customs information page. German Customs advise that for gifts to enter the country without duties or taxes, the value will need to be €45 or less. Should the shipment exceed the €45 limit, duties and taxes will be applied to the entire shipment. 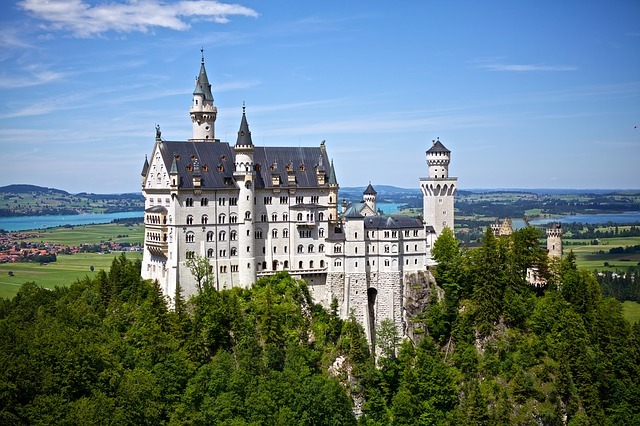 If you like to get out and about in the fresh countryside air, then Germany won’t disappoint, with its breath-taking scenery and its Disney-esque castles. There is plenty to see and do, including great walks and hikes, outdoor sports such as mountain climbing and skiing in the winter months. Like much of Europe, the weather in Germany fits the seasons, with cold winters and warm summers. Many people in the country speak English as it’s a business hub but the main language is German. It’s a great multicultural melting pot of the European Economic zone and, as Germany is part of the EU, its currency is the Euro. Don’t miss out on the famed Oktoberfest which is held across the country (and the world) every September. Another must see in the winter months is the Christmas markets, full of magical charm, which pop up across the country.